Why is a tutorial right for me? The Bicycle Repair man will teach you what you want to learn at your speed. You learn best with one-on-one instruction and the tutor’s undivided attention. Your time is valuable. Your tutor will help you design your classes and teach you at a time that works for your schedule. 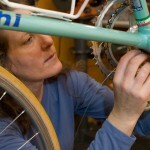 You will receive hands-on experience working on your own bike. You will learn what you want and become confidant in your bicycle repair skills.